When loaded with the available V6 engine, the Highlander can tow as much as 5,000 pounds. There are two engine options found in the Highlander: an efficient four-cylinder and a powerful V6. With the highest-possible Top Safety Pick+ rating, safety is never a concern in the Highlander. Space for up to eight and a great deal of cargo makes the Highlander more comfortable than most SUVs. The massive cabin of the Highlander comes filled with all of the features that you desire. Even with its size, the Highlander manages to travel as far as 25 mpg on the highway. When it comes to family-friendly SUVs in the Toyota lineup, there is no arguing that the Highlander is one of the top options available. Not only does it offers seats for as many as eight passengers, but it has the space that you need to take on a great deal of cargo as well. Even when the cabin is filled to capacity, the surprising towing capacity allows you to take even more along for the ride. To top off, the Highlander has an unwavering dedication to safety, which really helps make it great for families. 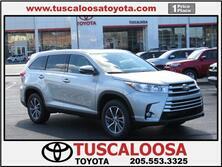 Families in the Tuscaloosa AL area who stop in and visit us here at Tuscaloosa Toyota, more times than not, leave out lot in a Highlander, and seeing as we have a vast inventory of the 2015 Toyota Highlander Near Tuscaloosa, AL, you can come and experience what the full-size SUV is all about. Before you do so, however, allow us to break down some Highlander's biggest family-friendly advantages. As we mentioned earlier, one of the biggest perks of the Toyota Highlander is its space, but also what it can do with that space. Versatility comes standard with the Highlander, and you are sure to find that the process of converting the SUV for storage or seating is extremely easy. Comfort is also at an all-time high. All three rows of seating feature comfortable seats, and even those located in the third row can be reclined back to provide backseat passengers with an unrivaled level of comfort. If you spend a lot of time on the road with your family, you will be sure to appreciate that the SUV is surprisingly efficient for its size and utility. Both the four-cylinder and V6 engine are able to travel as far as 25 highway miles on a single gallon of gas when power is directed to the front set of wheels, and when you take the size of the Highlander into consideration, it's clear just how impressive the feat really is. The efficiency makes the Toyota Highlander great for all those memorable road trips. When it comes to power, both the four- and six-cylinder options are able to deliver quite a bit. The four-cylinder cranks out a surprising 185 horsepower and 184 lb-ft of torque, and the available V6 is able to top out at an astounding 270 horsepower and 248 lb-ft of torque. The added twist allows the Highlander to tow up to 5,000 pounds, which makes it perfect for hauling a small camper or boat. With so many different models of the 2015 Toyota Highlander now available in Tuscaloosa AL, you can now stop by and see the impressively-large cabin of the SUV and test out its power for yourself. All you have to do is fill out the form to schedule a test drive. You can also feel free to give us a call or show up unannounced. We don't really mind how you choose to get in touch, we simply hope that you do. Once you experience the family-friendly features of the Highlander, you'll be glad you did. Also, be sure to check out our no-cost non-factory Lifetime Warranty, which extends the standard Powertrain Warranty for any new Toyota model.